Here is installment #2 in our “Week with the Leakes” series where we documented every single thing the four of us ate for an entire week (our last name is Leake)! I’ve already posted breakfast and snacks, today is lunch, and dinner and treats are to come. We recorded all of this during a random week in November. As I mentioned, this series is just a snapshot of our lives. 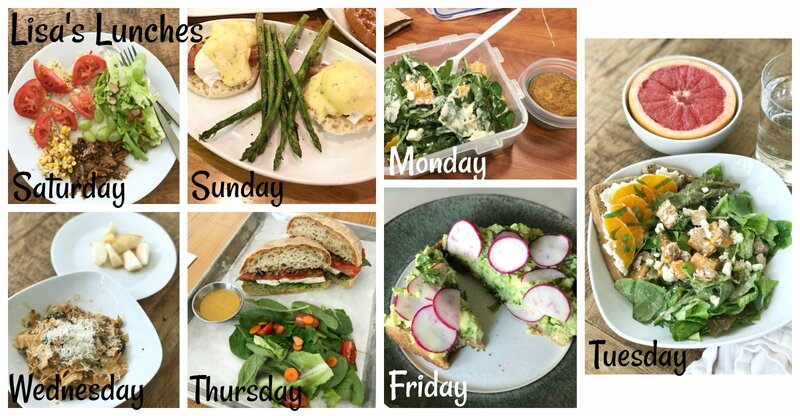 While it isn’t always a true representation of our diets as a whole (or easy to get the photo – some are blurry or not well lit), we did our best to share what a typical week of meals looks like at our house. And, even though beverages aren’t pictured, our drink of choice is usually water. My husband and I might have a cup of coffee (usually a Maple Mocha or latte with honey for me) or glass of wine (or a beer for him), and the kids sometimes have an occasional glass of milk or juice, but other than that it’s pretty much just water to drink around here! Also, new this year, we want to hear what you’re eating at your house! Inspired by a “Cash Confessional” series on a website here in Charlotte, I thought it’d be fun to ask you to share not only what you are eating but how much you are spending on food for your family. Signed copies of both my first (100 Days of Real Food) and second (100 Days of Real Food: Fast & Fabulous) cookbooks! To enter, simply read the rules and complete your entry no later than January 31st. Can’t wait to see what you have to say! 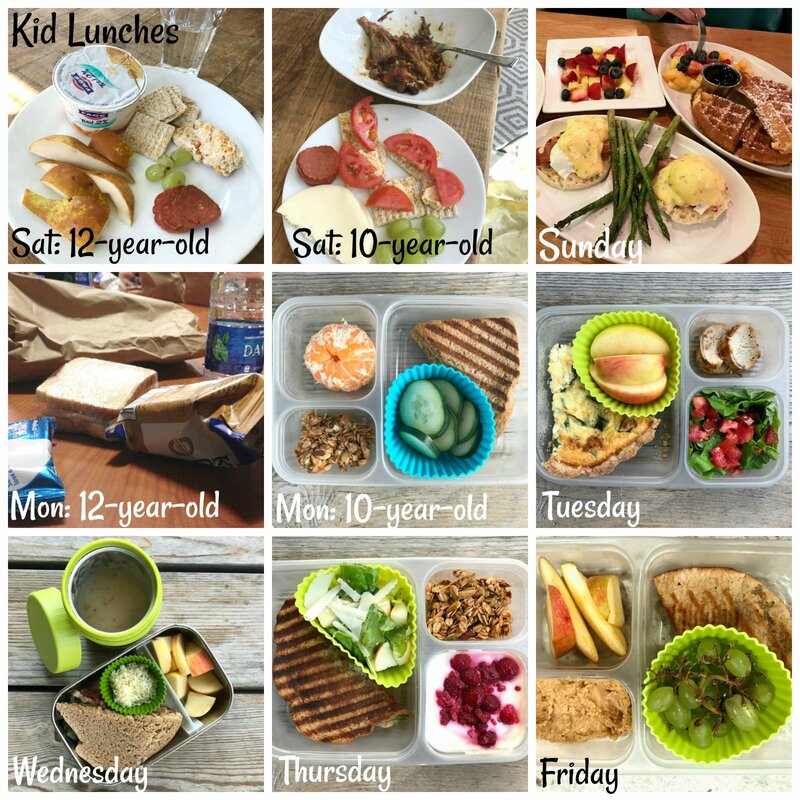 My kids’ lunches probably aren’t that much of a surprise since I often post them on Instagram and Facebook, but here is the week summary anyway. Saturday we all just had a random plate of leftovers or whatever we could find in the fridge (the 10-year-old’s bowl has leftover pulled pork in it). Sunday we were planning to have lunch at home, but our early morning gymnastics meet ran long. We were hungry, so we found a decent place nearby that sources ingredients locally. The 12-year-old had waffles with fruit, and the 10-year-old had eggs benedict with fruit (I ate the asparagus). Monday my other daughter had a defrosted panini (with pesto, roasted bell peppers and cheese), sliced cucumber, oranges and homemade granola. Tuesday both kids had leftover Ricotta and Kale Quiche, apples, leftover pork tenderloin and a little salad. Wednesday is normally our “soup day,” and they both had homemade (defrosted) potato soup (from my first cookbook) with cheese to go on top, BLTs and apples. Thursday they had more of those defrosted paninis, a salad with cheese and apple, plain yogurt mixed with a little pure maple syrup and frozen raspberries and homemade granola. Friday is “make your own lunch” day at our house, and both kids had a variation of grilled sandwich, grapes and apples with peanut butter for dipping. 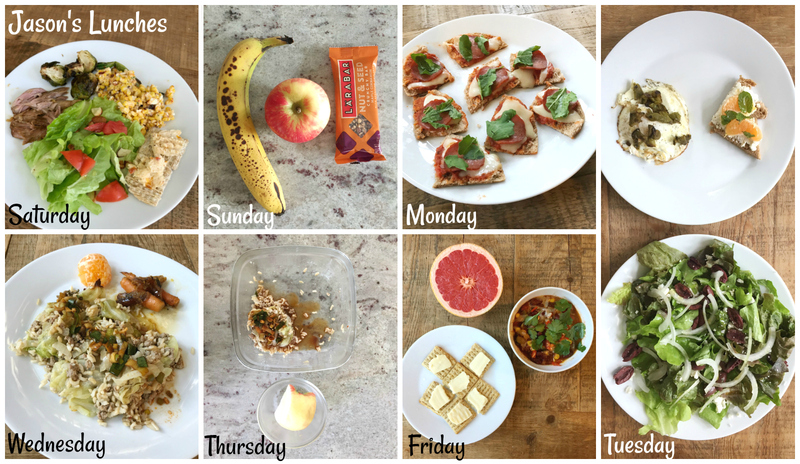 My lunches actually weren’t too bad this week (coincidentally) … no days eating a random assortment of snacks at the counter (or in the car)! Saturday I had mostly the same leftovers as the kids (pulled pork, corn, whole-grain crackers with tomatoes and salad). Sunday was when I took the girls out to brunch after the gymnastics meet and I had eggs benedict with asparagus. Monday I chaperoned the 7th-grade field trip and knew I would not be into the bagged lunch myself, so I carried around leftover homemade Butternut Squash Salad (with a little ice pack) and a Whole-Grain Pumpkin Muffin all day until lunch time. Once again, not only was I the only person who brought my own food, but I was also the only person taking a picture of it – a little embarrassing, but that’s okay! Tuesday I had the same leftover salad, but this time with leftover pork tenderloin pieces on top, a ricotta/orange/mint/honey toast on the side and a half a grapefruit. Wednesday I had leftover Cajun Alfredo with Shrimp (from my first cookbook) and sliced pears. Friday I had a light lunch of avocado toast (from my second cookbook) and some homemade popcorn (not pictured). This is what my husband ate … we clearly had a plethora of leftovers on hand this week, which is not always the case! Saturday he had the same leftovers like the rest of us. Sunday he was on his own, so he just had a variety of snacks when he got hungry for lunch. Monday our 10-year-old made a second plate of her same snack (whole-wheat pita pizzas) for his lunch. I believe he ate more than what was pictured on this day, but this is the photo I got! Tuesday he had a big salad with some of my ricotta toast that I had made and a fried egg (with roasted bell peppers on top). Wednesday he had leftover cabbage rolls (from dinner) that had basically just fallen apart by then, leftover carrots and an orange. Thursday more leftover cabbage rolls with an apple. Friday he had whole-grain crackers and cheese, a grapefruit and some defrosted chili (from the freezer). That concludes our lunches for the week … be on the lookout for dinner and treats next! The panini looks great! How do you freeze and thaw them? These posts are so fun to read! I was also wondering about how you freeze and thaw the paninis? Not sure how I missed that! Thanks for linking. Thank you so much for sharing this one ! Very inspiring and educational ! When I see your pictures, it seems so easy and doable. I wish I lived with you so I could eat like that. LOL I must be plain lazy!!! I just need to get organized. Thank you for sharing! I love the inspiration! Lunch is always hardest to come up with. I was wondering how you keep the paninis warm in your kids lunches? Or do the eat them cold? My son loves to eat paninis and grilled cheese sandwiches but not when they are cold. They are not kept warm. The only items that would be warm are those that go to school in a thermos such as soup or a pasta dish.